An ICC confirmation hearing is set for September 28, and if the charges are confirmed, Mr. Lubanga will be the first ever individual to be brought to trial at the court. Mr. Lubanga is the President of the Union des Patriotes Congolais (UPC), and was the commander in chief of its military wing, the Forces Patriotiques pour la Libération du Congo(FPLC), at the time the crimes were committed. From 2002 to 2004, FPLC commanders enlisted and forcibly recruited children as child soldiers, systematically abducting both boys and girls into their ranks. Mr. Lubanga is accused of playing an overall organisational and coordinating role in the UPC/FPLC’s policy in this regard. Information collected by the office of the Prosecutor at the ICC strongly suggests that his activities were supported by foreign nationals from Uganda and Rwanda, although the evidence is not sufficient to present a case. But Chief Prosecutor Luis Moreno-Ocampo said that the case is at a very early stage. “As prosecutors we have the responsibility to prove the case, and we believe our evidence is strong. 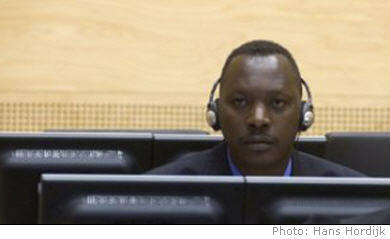 However, until his guilt is established Mr. Lubanga is presumed innocent. In addition, MONUC Human Rights officer Federico Borello said that numerous NGO’s and human rights organisations have sent letters of protest to the ICC. According to a latest Secretary General report, more than 18,000 children were released from armed groups in the DRC, from January 2004 to May 2006. Many have escaped, yet these children remain vulnerable to new threats including re-recruitment, as they find it extremely difficult to re-adapt to civilian life.